In the aftermath of the London attack, an image of a hijab-wearing Muslim woman went viral, and was used to signify Muslim indifference at ‘our’ suffering. In fact, the reaction to the image says more about ‘us’ and our political culture of denial, argues Fahid Qurashi. Following the recent tragic events in London, which led to the death and injury of several people, an image went viral of a hijab-wearing Muslim woman walking past some of those injured in the attack whilst checking her phone. The image circulated like wildfire across numerous social media platforms and was accompanied with commentary that infused the image with Islamophobic tropes – of barbarism, evil, comfort with violence, and a lack of care. As the image went viral, it was used to signify something more than the reaction of this single woman and, instead, was deployed to point to a broader problem of Muslims and Islam. Since then, the woman has released a statement about her sadness at the horrific, shocking, and numbing terror attack. The outrage over the alleged lack of care for mass violence was particularly puzzling in a week in which the death of 230 civilians at the hands of western coalition forces in Iraq and the death of nearly 50 civilians in a US airstrike in Syria went by without considerable public outrage. Added to this, images from the London attack also showed other people, who did not carry visible signs of Muslimness, walking unfazed past the same scenes. Beyond providing an ostensibly legitimate outlet for outrage at Muslims, the image seemed to be illustrative of a practice that is all too familiar: denial. Whether it is ignoring, downplaying, or justifying state violence that is regularly visited upon ‘Others’, the practice of denial is commonplace. In its most organised and pernicious form, denial is part of a broader political culture that has been purposefully cultivated over a long period of time and deployed to hide and justify state crimes. It involves the deliberate destruction of evidence of state crimes, such as when the British government destroyed documents of colonial crimes in Kenya. Given the centrality of language in the perception of social realities, denial involves the cultivation of a political language which constructs a universe with a favourable moral compass, and moral boundaries that legitimise and delegitimise ideas and behaviours in ways that serve broader political objectives. In a 1946 article entitled ‘Politics and the English Language’, George Orwell identified this practice and argued that political language was organised around “the defence of the indefensible”, and to “make lies sound truthful and murder respectable”. This use of language to hide criminality is alive and well in our times. In a 2012 article Glenn Greenwald outlined the methodology used by the Obama administration to count deaths resulting from U.S. drone strikes in a way that would make civilian deaths all but disappear: all military age males (typically twelve years of age and over) killed in a strike zone were counted as ‘militant’. Finally, denial involves the dehumanisation of vast swathes of the world’s population through language that excludes, via popular culture (see for example films such as American Sniper and its portrayal of Iraqis; television shows such as 24 and its portrayal of Muslims and Arabs; and newspapers such as the Daily Mail in which a cartoon compared refugees to rats), as well as by institutional practices that encourage a view of prisoners as something other than human (see for example the US military practice, as documented in Taxi to the Dark Side, of using a separate vocabulary to designate prisoners as ‘PUCs’ or ‘Person Under US Custody’). In an episode of Charlie Brooker’s television show Black Mirror, we see an image of the future in which this institutional practice of othering is taken to new extremes as soldiers are implanted with a chip that makes civilians appear as bloodthirsty zombies (affectionately known as ‘roaches’), which enables soldiers to kill them with guilt-free abandon. The culture of denial is organised into what Stanley Cohen calls a ‘Spiral of Denial’ which represents the principal means through which denial is operationalised. At the top of the spiral, an allegation of criminal conduct is firstly denied outright (‘it didn’t’ happen’). Often times, this is enough to neutralise the accusation for a number of reasons: the destruction of evidence, the difficulty of finding witnesses who are willing to testify and so on. If evidence does exist to corroborate the allegation it is moved to the second stage of the spiral where the criminality of the conduct is downplayed (‘it’s not what it looks like’). In this stage political language is used to transform mass civilian deaths into ‘collateral damage’, torture into ‘enhanced interrogation techniques’, military invasion into ‘self-defence’, and colonialism into a ‘civilising mission’. Finally, if this is not sufficient (because, for example, it can be shown that the term ‘enhanced interrogation techniques’ does meet the requirements of the definition of torture) the allegation moves into the final stage of the spiral, where it is neutralised away (‘it was justified and not illegal’). Tony Blair has responded to claims about the illegality of the invasion of Iraq at this level by appealing to a higher loyalty: it was justified because it secured national security. A recent example of the spiral of denial in action was that of a case in which the US air force attacked a hospital in Afghanistan in 2015, after which, the US military gave four different accounts of the events in four days. The advent of the information age means that access to information and breaking news is easier than it has ever been. The psychological burdens of denial are significant, and especially so in the context of a ‘War on Terror’ that produces daily atrocities and has resulted in the death of at least one million civilians, with the total number probably closer to the two million mark (which says nothing of the extensive physical and psychological injuries of the ‘War on Terror’, and the destruction of whole nations). And yet, even if we are capable of justifying this damage, we are nonetheless aware of its existence because of the saturation of news and information. 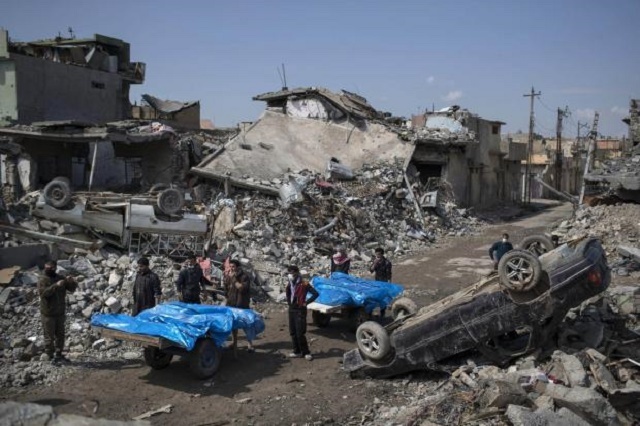 For instance, even if an airstrike on a housing complex is rebranded as ‘unintended collateral damage’ we are still familiar with what it entails: massive loss of life, injury, and destruction of property. 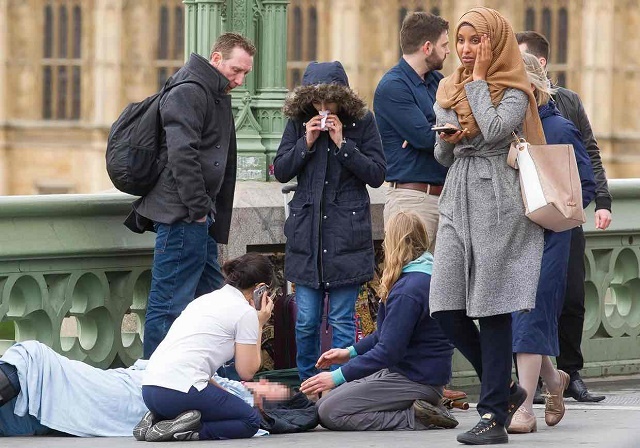 In this onslaught of reports about western conduct in the Muslim world, an image of a Muslim walking past a terror attack in London, seemingly unfazed, is the more significant image because it allows us to unburden ourselves and neutralise our feelings of guilt by pointing to Muslim indifference at ‘our’ suffering (which is why the woman in the image came to signify Muslims and Islam in general). In short, by being able to condemn those who might have reason to condemn us, we not only neutralise any sense of guilt associated with our indifference at ‘their’ suffering, but we also further entrench our psychology of denial by denying the legitimacy of their accusations since they can be shown to be equally indifferent. Instead of cultivating a psychology of denial, we need to use such moments of tragedy to reflect on the cyclical nature of violence and adopt ethical positions against all violence of this kind. We need to collectively fight for more democratic accountability of our governments and state institutions, since our primary responsibility rests in holding them to account. Fahid Qurashi is a Lecturer in Criminology at Canterbury Christ Church University.